Hey, he must not be named! Grab your Death Eaters and make some mayhem at Halloween parties this year. You guys will have a great time casting the Dark Mark and making Harry Potter pay for his infantile rebellion. We don't know what the Dark Lord likes to do at parties, to be fair. He might be the kind of guy who hangs out in the kitchen, waiting for the host to come out with more of those biscuits that look like fingers. Or, maybe he's the kind of guy that's outside gossiping with that girl who's always vaping. Wait, we should say plotting. We can't see him as the guy in the middle of the dance floor but hey, we've been surprised by him before! This two-piece costume will make you look the most famous villain in wizarding history. It'll be easy to transform, you don't even need to whip up any Horcruxes. 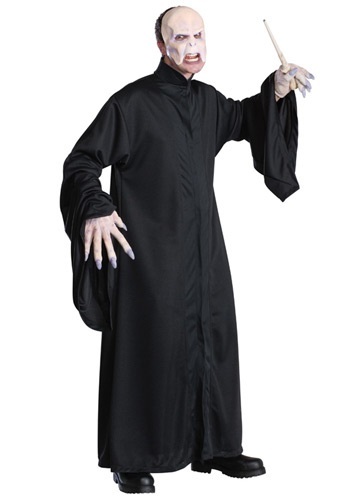 It includes a black, polyester robe and a latex mask. The tan-colored mask has purple veins and blue, raised veins on the top of the head. It covers three-quarters of your face and has slits for eyes and nostrils. The floor-length robe slips on over the head and Velcros in the back for closure. The long sleeves flare out at the cuffs. A foam collar that sits half-way up the neck tops the costume. You'll want to check out our Lord Voldemort hands to complete your look. You might be evil incarnate but that doesn't mean you don't know how to party!